Pinterest users are planners. They tend to plan well in advance of whatever holiday, season, or event is on the horizon. As marketers, we need to plan and prepare for those particular time frames and by pin exactly what people are looking for at the time they are searching for it. Want more information about what to pin all year round? Check out my (amazing!) Ultimate Pinterest Planner. Now let’s talk specifically about July Pinterest trends! Right now, summer barbecue recipes are really trending. Salads and side dishes are also trending, even though you don’t use the grill to prepare them! Think strategically about what people would be searching for as it relates to those summer barbecues. I hate to say it, but back to school is currently a trending topic as well. Here in Portland, the kids don’t get out of school till mid to late June, and by July, Target is already stocked with their back to school supplies. Be thinking about organizational hacks for all those school supplies that people will be buying. Summer cocktails and lazy days are how most of us enjoy soaking up the summer. Gardening and summer weddings are big, too. Also, don’t forget about Amazon Prime Day in July, which is a great opportunity to make affiliate income. Those mega-organized people out there who like to get a jump start on their Christmas shopping will be taking advantage of Prime Day and will eat up your pins about the topic. People are still vacationing and traveling. If you’re not in North America, think about the things that people in your country are doing as far as traveling goes. And for those who don’t like traveling or can’t afford it, pin about staycations and the best things to do in your hometown. If you’re e-commerce and sell products, think about what products you have that could be seasonal. Make sure you’re pinning about those products strategically. Make sure you have one product photo and one lifestyle photo of that product. Be sure to show the product in action to help the pinner engage with that product. If you’ve never done promoted pin advertising, it’s very simple. I’ve been doing a lot of intensive research about promoted pins over the last month, as we are planning to release a promoted pin service very soon. An important first step is to determine your goal. Your goal for promoting should not be only increased pageviews or traffic. It should also include: adding subscribers to your email list, product sales, or some other conversion that continually adds people to your community. If you have back to school content or maybe something related to travel and you have an optimized post that will really hook them in, run a promoted pin campaign around that content. Always be as strategic as possible. Your goal should be to keep your audience as engaged as possible so that you can continue to communicate with them. If you’ve listened to the previous “what to pin in…” episodes of the podcast, you will know that this is my favorite part! I love helping people generate ideas for their editorial calendars. As you’re thinking ahead about August and September, remember that the topic of organization is HUGE. Whether you have an organizing-related product or blog post, people are ready in August to really embrace a schedule again. They feel the need to get back on track and into a routine. Not everyone lives by a school schedule, but most people do. If moms are your target audience, they are willing to invest in things that will make their lives easier. Share whatever you have that they can use to get back into a routine. This is a super fun tip for those of you who have any meal plans or food-related topics. Try pinning specific content on a specific day. Sunday is a very heavy day for food when it comes to Pinterest searches. Most people do weekly meal plans on Sunday and grocery stores are busiest on Sundays between 2 and 5 pm. If your audience works full-time, Sunday is their only time to prepare for the week. Pin those food-related pins all day Saturday and Sunday. I’ve also heard that travel is searched for heavily on Fridays because people are thinking about the weekend that’s coming up. Look at your trends and listen to last week’s episode about using analytics to help you create content, to give you some ideas about what you can be pinning on specific days. If you want to get more mileage out of your popular posts, try collaborating with other bloggers by joining Tailwind tribes. 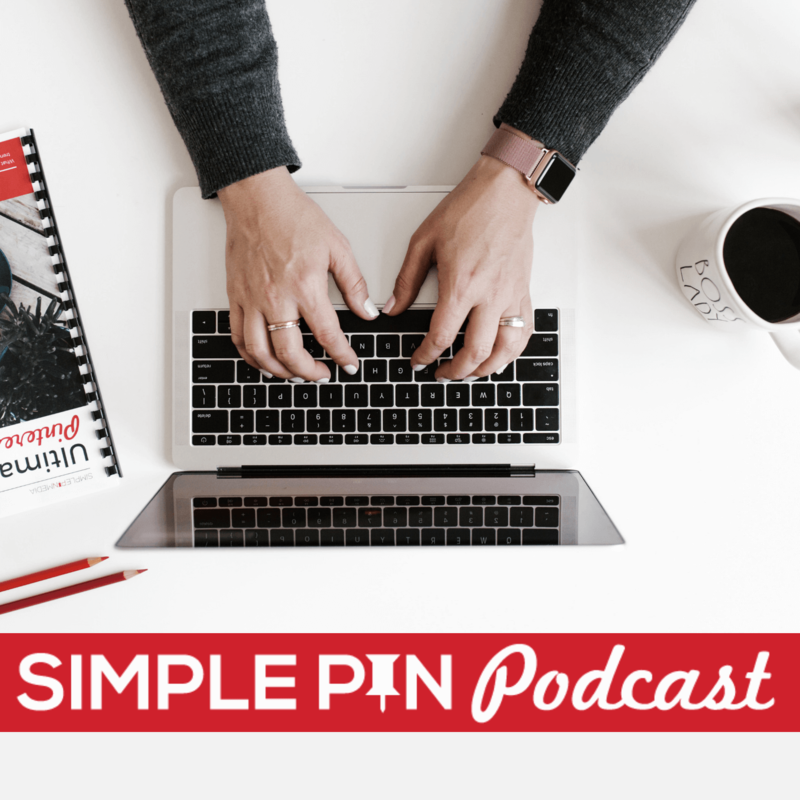 We’ve experimented a lot with tribes here at Simple Pin and it’s been fun and rewarding. It’s such a great way to expand your reach. Make sure you’re really clear about what tribes you’re joining. Tribes that get really big can become super time-consuming. I’m all about watching how much time you spend on something and what your return will be for that time spent, which I talked about in this podcast episode about KPI’s. Make sure the other people in the tribe are sharing things that are similar to your niche. A pin isn’t just a pin. You want to be showing Pinterest what your profile is about by what you are pinning. If you’re new to Tailwind and know nothing about it, you can head over here and get 100 pins for free to test out the Tailwind scheduling tool. It’s a great way to give Tailwind a trial run before buying it. We want to help you be effective and smart with your Pinterest marketing. Spend 1-2 hours per month to making a pinning game plan for the month. Set a timer so that it doesn’t become too time-consuming. The big thing to remember is just to keep pinning what your audience is searching for. If you’re doing that, you’re doing great. You have provided great pinning ideas for July on Pinterest. It is necessary to pin something that is in trend according to your home town. I like the tips “content planning idea” and here I have learned something new. Hi, I’ve been listening to your podcast and want to redo several of my pins from my site. I’m new, (10 or so posts) so I think it’s worth it to try to optimize my Pinterest images. My question is, what do I do with my original pin images that are already on Pinterest? If I remove them from my post, will the pins on Pinterest still lead back to that post? I just don’t want to clutter up my posts with too many images.